Preprints (earlier versions) of this paper are available at http://preprints.jmir.org/preprint/8236, first published Jun 19, 2017. Background: Digital self-management in cystic fibrosis (CF) is foreseen as a means toward better understanding of the disease and its treatment and better adherence to the treatment. Mobile apps hold the potential to provide access to information, motivate, and strengthen compliance. However, to deliver high-quality apps, the development should be based on thorough knowledge about user needs. Empirical research on the user-centered development of mobile apps for health care is, however, still limited. Objective: The aim of this research is to develop and evaluate an app ecosystem for self-management in CF. It targets not only those directly affected by CF but also parents and health care professionals involved in the treatment. This paper covers the first step of the design process that aims to analyze the context and the user requirements. The primary research question is as follows: what digital support has the potential to usefully support persons with CF and their caregivers in the CF care? To answer this question, we address two preliminary questions: what important factors in everyday life affect the care of persons with CF? and how is the CF care delivered today and what are the limitations of CF care services? Methods: The overall research adopts a user-centered design approach in which future users are involved in the development process from the very beginning to ensure that the apps developed best suit the potential users. The research presented in the paper follows an interpretative case study research strategy seeking to understand the concerns and needs of persons with CF and their caregivers. Data were collected through semistructured qualitative interviews involving 74 participants in seven European countries and from internet forums. Results: The results of the analysis phase show a strong need for individuality of the digital support, as well as for its adaptability to different contexts. The paper presents the concerns and needs of the participants in the study and extracts a set of relevant features for a self-management app ecosystem. Education, enzyme dosage calculation, nutrition management, treatment organization, health diary, treatment follow-up, practical guidelines for treatment, communication with doctors, and communication with peers are foreseen as useful features. Conclusions: The results indicate the readiness for self-management in the CF care even in countries that provide well-functioning health care services for CF care. The large diversity of user requirements identified reflects the crucial role user integration plays in developing apps for a chronic condition such as CF. The need for personalization stemming from the individuality of the patients and the need for communication with health care professionals support the idea of an app ecosystem for the self-management of CF. The market for wearables and mobile apps for monitoring health data and receiving information and guidelines on health-related issues is growing. Half of the participants in recent user surveys would use an app to manage their health, or had already downloaded one [1,2]. Health management through apps may be particularly beneficial for persons with chronic conditions who often require daily care and sustained self-management. In fact, different reviews [3,4] have observed a positive effect of the use of information and communication technology (ICT) for facilitating self-management of chronic diseases. At the same time, the number of persons living with a chronic health condition is increasing across countries [5,6], and they are responsible for most deaths in the world . This puts health services under pressure. Thus, the overall need to promote self-management in health care is strong. Self-management is seen as a means to better understand and cope with a disease and its treatment, for example, by supporting behavior change and treatment compliance . Effectively pursued self-management may contribute to increased life expectancy and a better quality of life (QoL). One way to support self-management is to increase the person’s knowledge about the condition and to foster perceived self-efficacy . For successful engagement, patients need to feel empowered and enabled to participate in the management of their health . 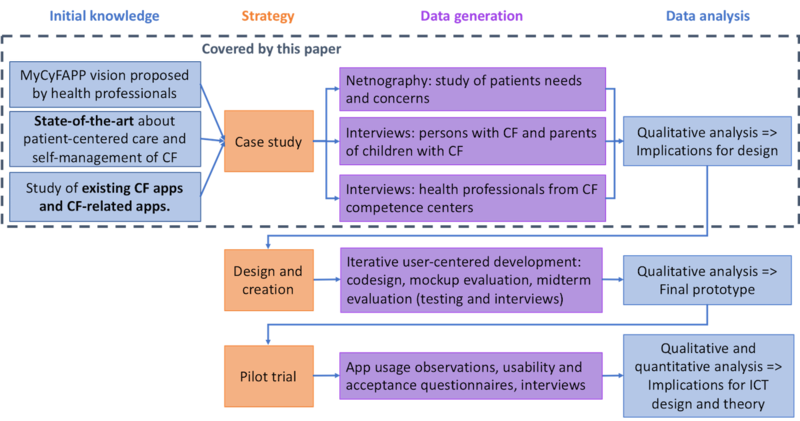 In this paper, we present a case study aiming at understanding the concerns of persons affected by cystic fibrosis (CF) and their needs, and we derive implications for the design of an app ecosystem for self-management of CF. CF is a congenital, chronic metabolic disorder that affects the digestive and respiratory tracts resulting in generalized malnutrition and chronic respiratory infections. There is still no cure for the disease. CF is a lifelong condition that often begins to affect the daily routine of parents and patients right after birth. It is a very complex and heterogeneous disease and affects more than 40,000 people in Europe, with the number rising. The health condition of persons with CF can change rapidly. It can be positively influenced by good treatment, which renders daily, lifelong therapy essential. Many persons with CF tend not to adhere to parts of the therapy , making it necessary to develop an efficient way for self-managing the disease. The CF care experts involved in MyCyFAPP identified enzyme dosage as a key challenge for persons with CF. Most CF patients have to follow a pancreatic enzyme replacement therapy, where enzymes have to be taken with each meal to help digest food. The amount of pills to take depends on the type of food and in particular, on the interactions between fat and other nutrients in each meal. MyCyFAPP is also researching on the role of individual digestion conditions, but regarding this, no conclusion can be presented yet. Enzyme dosage is an essential part of the CF therapy, with practices on recommended dosage still varying across Europe . A wrong dosage can lead to malnutrition and gastrointestinal problems . In parallel with the design of digital support, the medical team in MyCyFAPP is currently developing an algorithm for dosage calculation. An aim is to integrate this algorithm in the digital self-management support. This paper focuses on the first step of the user-centered design process, that is, the analysis of context and user requirements. Patient-centered care is a comprehensive approach to the patient-HCP relationship, which includes aspects of self-management, patient education, and clinical practice . Self-management is particularly relevant for persons with CF. CF typically shows a high degree of individuality with great variability of the disease and related differences in treatment schedules and patient needs. Therefore, it may be argued that it is crucial for CF patients to be able to act as an active partner in their relationship with the HCPs. A patient-centered approach to care will influence the relationship between the patient and the HCPs . Irwin and Richardson  explain why both parties’ needs and perceptions are fundamental: they have to collaborate and share knowledge about the treatment and the course of the disease. This also implies that the patient accurately reports activities and symptoms and actively complies with the treatment routines by changing behavior in line with changing health needs. The HCP has a crucial role in determining individual treatment routines together with the patient. HCPs can support the patients’ self-management behavior between consultations, for example, by providing them with the necessary knowledge. Collaborative roles of patients and HCPs are discussed in more detail in other studies [10,18]. One way to foster patient self-management is through personalized apps. However, to deliver high-quality apps, one should base the development on thorough knowledge about user needs, which stems from a user participation methodology. To our knowledge, little research work has been conducted in the area of mobile digital self-management of CF. A search in the Scopus database for articles containing the key words “cystic fibrosis” and either the keyword “app” or “mobile application” returned only two relevant results in May 2015 [19,20]. Cummings and colleagues  describe a trial to evaluate the use of an app for CF patients to self-report symptoms and communication with mentors. Their research indicates that digital self-management for CF is promising. The trial demonstrates that the use of an app is feasible with a geographically dispersed CF population. The app was generally considered to be useful and allowed CF individuals to focus on changes in symptoms. However, the functionalities covered by the app were determined by the nature of the experiment rather than the users’ requirements. Building an app on top of user wishes, as it is being done in this research, is more likely to match their needs and converge into a highly usable and acceptable solution . Hilliard et al  focus on user needs. Their study is built on questionnaires and semistructured interviews with adults (older than 18 years) with CF. Participants were asked about their preferences for an app for self-management. They found that persons with a smartphone would have the app to help them manage the disease. The study identified a list of preferred features for such an app. This list of features included, but was not limited to, access to health information, communication with other people with CF, communication with health providers, automation of the process to order medication, and tracking and visualizing health behavior. Hilliard et al  also describe some nonfunctional concerns such as the need to tailor the app to CF therapy in contrast to generic apps; the need of an app interface that requires little interaction from the user’s side (that does not take much of their scarce free time), the need of having a single app with multiple features instead of multiple apps, the possibility to customize app features, and privacy settings. Hilliard and colleagues  present some initial expectations for a CF self-management app ecosystem that are highly relevant for our study. We go beyond the scope of both previously discussed studies as we include multiple stakeholders (parents, patients, and doctors), patients from different age groups (children, teenagers, and adults), and participants from multiple countries across Europe. In addition to the literature search, searches on Google Play Store and Apple App Store (the two biggest app Stores) for CF-related apps revealed 35 apps that were available for free and could be used for self-management of CF. Apps used for fundraising for CF and one e-book app for a scientific journal about CF were excluded. All apps were downloaded and tried. The app search gave an overview of what is currently available to persons with CF. We found that the most frequent features are educational information, reminders for medications or events, medicine registration, symptoms registration, social networking, and guidance on how to perform treatment (specifically the chest massage). The few CF-related games available are about educating the patient; one about helping the child to perform respiratory therapy by blowing in the phone. The search inspired our interviews as it gave us ideas about features that could be included in an app for CF. It showed that some needs expressed in the study by Hilliard and colleagues  are not yet addressed by any app. In particular, there are no apps that facilitate communication with health providers, or that track and visualize health behavior. Looking back at the apps after the case study to be described in the paper, we see that none of them cover all the nonfunctional concerns raised by users. The apps often revolve around a single functionality, offer no customization, and often require time-consuming data input. A case study is applied for the analysis of context and user requirements. A case study is an inquiry that focuses on one aspect to be investigated with the aim to obtain a rich detailed insight into the life of the case and its complex relationships and processes . In our work, we study the context of care of persons with CF in depth. Related to the holistic framework proposed by van Gemert-Pijnen et al for the development of electronic health technology , this step maps to the “contextual inquiry” and “value specification” activities. Design and creation is applied for codesigning, developing, and testing ICT artefacts . The artefacts are not solely software prototypes but also include paper prototypes and mock-ups. This step maps to the “design” activity in the framework of Gemert-Pijnen et al . Finally, a pilot trial will be conducted to evaluate the final software prototypes and provide evidence of the usefulness of the solutions. The trial is conducted by the CF care experts involved in MyCyFAPP as an experiment , investigating changes in physiological parameters and QoL following the introduction of the solutions. In the ICT research study, we do, however, not plan to compare the situations “before” and “after” the trial. The case study, as well as design and creation, follow an interpretive research approach. We do not prove or disprove a hypothesis but rather aim at understanding the social context for the systems we develop. The context of the case study is the everyday life of persons with CF and their caregivers in seven European countries. We seek to shed light on the tasks needed for the CF care, the challenges encountered in the care, and to derive the implications for ICT support. As a starting point for the study, we use different sources that were earlier summarized in the paper. First, the vision of MyCyFAPP was developed by experts in the CF care, working in six different CF competence centers in five European countries. In addition, a study of the state-of-the-art for digital self-management in health and the testing of available CF-related apps provided us with an initial understanding of the context. During the case study, data were collected through netnography and semistructured interviews. An online forum research based on the concept of netnography was first performed. This gave us a broader overview of the patients’ needs and concerns. Netnography is “a written account resulting from fieldwork studying the cultures and communities that emerge from on-line, computer mediated, or internet-based communications, where both the field work and the textual account are methodologically informed by the traditions and techniques of cultural anthropology” . The method allows to collect questions and concerns from a broad audience among the CF community. It offers additional insights as the interaction is more anonymous than direct interviews. This potentially leads to more open discussion than during personal contact with a stranger. Five internet platforms (two in the English-language [27,28] and three in German [29-31]) were researched for entries about enzyme therapy, food intake, as well as details about patients’ daily life with CF. All forums that were accessed were registration free, and the researchers did not participate actively in any discussion. The data collected were analyzed using the coding software Dedoose provided by SocioCultural Research Consultants, LLC (Manhattan Beach, California). Figure 1. Strategies for the information and communication technology (ICT) research in MyCyFAPP. CF: cystic fibrosis. Table 1. Overview of the participants across countries and target groups. Qualitative semistructured interviews with persons with CF, caregivers, and HCPs with CF care expertise were performed face-to-face, as well as over the phone. Although persons with CF and caregivers describe personal concerns and needs, HCPs share general experience and experience-based advice. These viewpoints are complementary. All interviews were conducted individually, except for practical reasons that of three doctors and one nurse at the Norwegian CF center and of three doctors and dietitians in a Portuguese CF center. The study includes all relevant user groups: children and teenagers with CF in the age range of 4 to 16 years, young adults with CF older than 16 years, parents, and HCPs. HCPs include doctors, nutritionists, and nurses. In addition, members of CF associations were also interviewed, so that a total of 74 participants were included. They were recruited through national CF associations and hospitals in seven European countries. The participants could choose between face-to-face or phone interviews. Table 1 gives an overview of the participants across countries. A central element of the study is to include several countries. Different countries organize their CF health services differently, have different digital routines, and cultural differences. The goal of including equal numbers per target group in all countries could not be achieved. Given that the treatment is time-consuming, accessibility to patients was a major challenge as it sometimes involved a lot of extra time and effort for the participants. Further challenges in recruitment were the fact that young children could not be interviewed over the phone leading to occasionally long travels to CF centers and that patients could not meet for group interviews because of cross-infection risks. In addition, children and teenagers who are supposed to be included in the planned clinical trial later in the project were not involved in the interviews to avoid a bias. All participants were given information about the research and the management of collected data. They signed under a letter of consent. The interviews were recorded and transcripts of those written and notes taken for data collection and analysis. The transcripts were sent to interviewees for feedback. The analysis of collected data was performed in an inductive way. The framework and the principles of Klein and Myers were used in this process . The researchers read the written interview transcripts and performed a first independent round of thematic analysis  resulting in a number of initial topics. Then, a refined working set of topics was iteratively created through collaboration among the participating researchers. Over 450 needs were identified across the target groups. The participants in the study did not only describe their own experience and express their own needs. Parents explained difficulties encountered by their children. They have expectations about how children should tackle the disease, and they foresee useful app features for children. On the basis of experience from the past, parents with older children and adults with CF expressed needs on behalf of parents with younger children, children, and teens. Although the vision of MyCyFAPP includes a management tool for HCPs, HCPs found it difficult to express needs for a tool intended to support their own work. Their main concern was the digital support for the patients. Results from the netnography research show that under a total of 32 main topics identified, enzyme is the most discussed one in user forums (51 mentions), followed by motivation and discipline (44), diet (38), weight (36), exercise (21), supplements (20), and time management (16). Topics can be further classified according to whether the user is a parent or a patient. The most important themes discussed by parents are difficulties with their children not eating enough, not gaining enough weight, and not taking their enzymes. Physical exercise appears to be more of interest for older patients. Issues such as time management and discipline are more often discussed by adults with CF. These results indicate the relevance of the topics suggested in the MyCyFAPP vision, in particular, support of enzyme dosage calculation and nutrition management. CF is a serious disease and its treatment demanding. It takes time for caregivers and persons with CF to gain experience in the treatment and to establish routines necessary to handle it. The level of experience with the disease and the ability to set up routines lead to varying needs. Whenever there is a change in life circumstances, when the health condition changes, or when the patient grows older, daily life and the connected needs are affected. Patients behave differently, and the level of compliance to the treatment varies. They also accept the disease differently. Behaviors change over time too. Accordingly, the level of support to comply with the daily treatment and make life easier varies as well. In the following, we describe these main influencing factors and, for each factor, derive implications for the design of digital support. A summary of the implications and their relations to the identified factors is presented in Figure 2. The interviews were conducted in different languages and most quotes included in this paper were translated by the authors. When English was used, participants were not English native speakers. Many participants in the study use Creon as medication for enzyme replacement, and therefore, referred to Creon instead of enzyme in the interviews. In the following, we use “parents or mother or father” and “child or teen or adult” for “parents or mother or father of child or teen with CF” and “child or teen or adult with CF,” respectively. Yes, the day is busy. It starts early. First, 20 minutes medication and then getting everything else ready. And then there are times with infections, and he is in a bad shape and tired, and his motivation is low. We cannot say that it is not demanding. It is. Figure 2. Overview of relevant app properties and features and relations to influencing factors. It is hard to find the time to do physiotherapy. Time is the biggest problem. Most patients want a normal life. They have to go to school. Some adults want to work. They want to have a family. CF is not about just taking the pills in the morning and then everything is solved. The nutritional aspects, the Creon, the medications, the physio, the aerosols, the homework...There is not much time during a day. I go to work in the morning while she is at school and then I dedicate all my time to her. Every day. However, we have automated this since she was born. Follow-up of CF takes time and needs caution on a daily basis. It is paramount if the routines, for instance training, are integrated in the family life. The parents need tools to make the life easier and to have to be dependent as less as possible on the disease. To try to live as normal as possible. It is not realistic to expect, neither should the HCPs require, that an app is being used every day. In the following, we will see that particular situations, for example, eating a new type of food or taking new medication, can make an app particularly useful. People with recent diagnosis often contact the organization before they visit the CF Competence Centre. They search on Google and get in contact with us often the same day as they are diagnosed. Parents with new-borns need more communication. The patients contact the Centre when they need advice. Usually parents with young children contact us often. Many of the telephone requests are about enzyme dosage. Many patients struggle with stomach pain [...]. Sometimes this is, because the patients are unable to calculate the correct amount of enzymes. Compliance to correct enzyme dosage is difficult in all age groups. Initially it was difficult to find out what was the right amount of Creon. Especially when he was a baby and he was still on mother milk [...]. It gets easier when the kids are able to eat by themselves. The Creon before meals, it is a problem when the child doesn’t want to eat. It is a challenge to find out how much Creon to take. I have no problem with Creon. I am used to it. It also works well when I am not at home. In the beginning, I had to search, but now I know it is 8 or 10 pills. He gets 4-5 capsules a day, but I wonder if it is too little. I see on the internet that other children take much more at the same age. But he is growing, he is active and he has no constipation, so I assume he gets enough. Maybe I am giving too much, but I do not think so, because he is doing well. There was a moment where he was not growing that much and was not taking weight very much. I tried to give more Creon and it seems that it was the problem because it was much better afterwards. Her day is busy with exercising, medicine intake, school homework […]. We have to be well organized. We have routines that help to not forget anything, especially medication and physiotherapy. Especially at the beginning when the routine was not in place, we had a paper sheet with a weekly table. In the rows, we had the different times for medication, what kind of medication. This sheet also serves today when he is going to his grandparents, when we organize the treatment and the therapy to be taken there. For us, no longer, because we have the daily routine. Growing up is another factor with a great impact on the life of children and teenagers with CF and their caregivers. Such as everyone else, children and teenagers with CF go through different phases as they grow up and mature. In different stages of their life they have different needs. Growing up, they take more and more responsibility and mature to young adults. An app has to take into account these different needs and levels of maturity and should support patients and parents at different stages of their development. It is important for CF patients to have a good nutritional status. It is important that the dieticians can begin to give parents advices very early or directly to the children if they are old enough. The parents get a lot of information, they learn about what they should do. The children are often no so interested. They play or do other things when the doctors explain. That there is something not working perfectly with my lungs and that I have to do all the inhalation and take enzymes to feel better. It is sometimes difficult to estimate the dosage of enzyme. It is easier with young children because the parents always observe the stool. When children get older, the parents don’t observe the stool all the time [...]. It is a bigger challenge for school-age children. Children have to learn when they are old enough about how much fat the food they like contains and how the stool should look like. When they get to the point where they should take responsibility, the doctors forget that they have [only] taught the parents. They have the expectation that young people know, but may be one should start educating again. Facing adolescence it is important that she [the child] starts to become autonomous and to have that information without the mother being pending. So having a dual app will be important in the transition to adult ages. The idea is to “replace” the mother role and be more independent. For this, if there is an app to help it would be fantastic. Young people like games, so games might be used for learning. It’s more fun than listening to a doctor. Implications for design: an app can support HCPs and parents in teaching young children about CF in a way that is easy to understand and exciting. It can raise their interest and help avoid a knowledge gap for older children, allowing children and teenagers to slowly take over more responsibility for their treatment. Teenage time is the most difficult. They cannot participate to the same activities as their peers. Some think about suicide. At 20, one gets more mature. Teenagers often need more motivation. It is important to follow them up more. But this is for some teenagers, not all. Sometimes they find it difficult to follow the treatment because the transition from child to adult is not an easy period, as girls often want to be thin and boys want a lot of muscle mass. The rebellion phase of teenagers—it is very difficult. They want to know exactly why the drugs are important for them. When I was a teen, there were sometimes periods where I did not want to talk about CF. As explained above, in general, parents take most of the responsibility for the treatment of their children before they go to school; starting school, children have to start taking responsibility and manage their disease more on their own; as teenagers, they have to become even more independent but often miss the motivation for it. Despite this subdivision in very general age groups for the level of independent managing of the disease, there is much variation about how early children start taking responsibility. This depends on the children but also on their parents. Some parents give responsibility to their children very early. Other parents are very protective, and children are used to rely on them, even when they become young adults. She knows everything since she was 4 years old. I give her the pills. She got a lot of responsibility when starting at school, including taking medication on her own. I started to be responsible for medication at 12 years old, for physiotherapy at 14 years old. As a parent, you have responsibility. It is a question of maturity. We are not yet there. The Creon is much easier because he knows that before eating he has to take some pills, but we have to “stay behind [ie, supervise] for the aerosol and the physiotherapy. He won’t do that alone. Medication: 12 years old; Physiotherapy: 11 years old; Creon: 6 years old; I use the same methods as my mother to put them into boxes. My mum still reminds me for some new pills, but I’m independent. I started to manage Creon at 7 years old. My parents still remind me to take aerosols [inhalation] and Creon with snacks. She is totally dependent on me. She takes a lot of different medications that can cause negative interactions. I need something to manage this and be safer or to promote her independence once she grows; I control if she needs more Creon because she has diarrhea or less because she is constipated. We have to remind him. Maybe I am a too protective mother. I still prepare things for him. In the morning, everything is prepared, so he can start inhalation. Also when he comes to the table, the number of Creon is near his plate. [I stopped reminding him] when he was 8 years old, I still give him a paper, on which all treatments are written down (as a reminder), but he prepares everything on his own. Most annoying is the time lost, especially in the morning, it is exhausting to remember what to do when, mum sometimes helps with remembering and with instructions. At 7/8 years old he did both treatments and Creon intake autonomously. Nevertheless, we still remind him to take pills with him. I take responsibility myself. Sometimes my mother reminds me about the medication at lunch time. This works well. I started to take responsibility for the treatment when I was 16-17 years old. Implications for design: with changing age, the purpose of the app changes. At first it is all about explaining CF and the treatment connected to it in an easy and entertaining and playful way, to ensure the attention of young children. Later on, it is necessary, to help children and teenagers to start managing their disease, at first together with their parents (eg, child registers food and follow-up by the parents), then on their own. Additionally, for all age groups, motivational elements play an important role: young children need to be motivated to learn about CF and to stick to the treatment and older children and teenagers have to be motivated to take responsibility for the management of their treatment. A digital support tool can help to ensure that children, teenagers, and young adults with CF can lead an independent life, and it can relieve parents from some of their responsibilities and therefore, make their lives a little bit easier (eg, by giving an overview of the treatment and offering reminders). An app has to be very flexible and adaptive to work for these different needs of users of different age groups. There have been some problems at school with bullying from the other children… There have also been problems with lack of understanding of the seriousness of the illness from some of the new teachers, because the child does not look ill in any way. It went well when he was a child. [...] for 9 years he has been with the same friends. His friends know about him and they tell him to not forget his Creon. He changed school when he was 13. Then he was shy about it. He did not want to show that he was taking medicine. It might be difficult to fulfil the diet and the pancreatic enzyme replacement therapy when they go to school or other activities out with friends. When we go to restaurants, we don’t know how the meal is cooked. I have also an aerosol that I take three times a day, morning, midday and evening. The one at midday, I often forget because I am not always at home and I have no other aerosols at this time. At the university, I also lack time at lunch time to take the aerosol. When many things happen, when things are joyful, then he forgets about it [Creon]. Afterwards he has so much pain that he knows this was wrong. I know that I must take the Creon. Sometimes something happens that I have to take care of, and then I don’t know if I have taken it or not. Implications for design: an app can help to tackle these different kinds of changes. Support for explaining other people, enzyme calculation, and reminders can be useful. At a certain moment we had to go from 2 aerosol to 4 per day. [...] It was challenging to make it all fit before he is going to school. [...]. Mainly time is challenging, and if he has to get up earlier, motivation is also a challenge. There are many things to learn when you get new medication. People get too little information about what the side effects are and how to administer the drug. When I am sick, I lose appetite and I lose weight. Now the treatments are harder than when I was younger. I had less things to do before...Physiotherapy is the most stressful. It increases the complexity of managing the nutritional aspects. From the CF viewpoint, I need to take more fats and eat more and, from the diabetes viewpoint, I need to reduce sugars and fats. Nutritional problems increase with the disease severity, and often when the lung disease escalates...Creon and nutrition often stabilize when patients grow up before lung diseases appear again and ruin it. Some have a disease such that whenever they are at the consultation, we identify a new complication or a new disease, and a new negative message enters the line of others. This is hard. They fear that they get worse or their nutritional status deteriorates. Implications for design: it is not realistic to expect that an app can solve all challenges risen by the severity of the disease, but helping to maintain the health condition as good as possible is a leading motivating factor for an app in the first place. An app can support tackling new medication and can help learning about new diseases. An app can also motivate to adhere to the treatment. Another important factor affecting the life of children and teenagers with CF and their caregivers seems to be how open they deal with the disease, as well as their acceptance of the disease and all that comes with it. Some are ashamed of their disease, they try to hide it in school. They use a bag for sweets to hide the medicine. Youngsters [...] don’t want to do the therapies/enzymes in school, they don’t want to show that they are sick. We have taken over the responsibility for physiotherapy...He is an ordinary schoolboy with physiotherapy in the evenings. Thus he is released from the stigma attached to CF at school. Especially, friends seem to have a great positive impact on the motivation of young persons with CF and can help them to stick to their treatment. Some people are open about their disease while others never tell anyone. Those that are open often handle things better. Some are afraid that they would not get any job, if they tell. It is difficult for her to understand or accept the illness—in her eyes she does not need the medication. She gets pain in her stomach if she does not take Creon, but even so she forgets or ignores to take Creon when she gets something to eat from others, for example an ice cream at a friend’s house. My mum sometimes tells me that I have a better life than many kids—but that is not true, they don’t have to do all the treatments. [...] My family wants me to go to Amrum for rehab, but I don’t want to! It will be like being in a hospital for weeks! My grandma told me she will get an Ipad for me when I go, but I don’t want to! They watch TV, cartoons, while doing the aerosols. For physiotherapy is different, the child needs to be concentrated...Sometimes, it is difficult because he just wants to play. I have to do it [the treatment], because I have a disease. I know that my wellness depends on it and I have internalized the processes. I don’t think too much, I do it. Overall, openness about the disease and acceptance of the disease seem to be very important for the compliance to the treatment. Openness about the disease makes support from others possible. Acceptance has a great impact on the compliance to the treatment, and the acceptance of the necessity of the treatment seems closely connected to the realization that only compliance to the treatment can ensure feeling well and staying alive. Implications on digital support: to foster openness and acceptance, especially young patients need support in form of explanation of the disease and motivation to stick to the treatment. Easy to understand knowledge about the disease and treatment should be made available. Additionally, prejudice must be reduced to avoid stigmatization, and patients need support to be able to easily educate other people about their disease, so social support becomes possible, which seems very important for increasing and holding up the motivation of patients. I do not have to do anything to motivate him to comply with the treatment. He knows that he has to do it if he wants to be healthy. It is not the right word. To be as good as he is now. It’s sometimes difficult to remember if I have taken the medication or not. Maybe I am doing something else or something arises, and then I don’t know [...] I have a [...] brother with CF. He is not responsible at all, so I take care of him. Some physiotherapy and medication can be missed because she forgets. Youngsters, they don’t eat enough, they don’t eat the right food. They don’t want to do the therapies and take enzymes at school. They don’t want to show that they are sick. It is not easy to take enzymes. And, in all age groups, compliance with Creon intake is difficult. Physiotherapy is very important. [...] The patients really do not like to do it. It is time consuming. Coughing out sputa is also annoying. Physiotherapy works only if the child collaborates. The little one doesn’t want to eat at the kindergarten, because he doesn’t feel like home there. Especially in the kindergarten, he is a very bad eater. He doesn’t like a lot of things. Sometimes children have eating problems. An app that motivates them to eat is useful for those patients. Regularity and discipline are important. [...] It is tough to motivate teenagers. Girls from 10/12 years on don't want to gain weight. Physiotherapy and inhalation are challenging. The effects of not adhering are not visible at once as for Creon. Young people do not think about that life may be some years shorter. Patients don’t always feel a negative influence if they don’t follow their physiotherapy or do not do inhalation. This part of the treatment is important for their future, but it is challenging to spend more than 2 hours a day for long time effect. Most of the patients take their Creon because they get stomach pain when they don’t. Taking pills does not take time either. Inhaled drugs require time. We run together everyday. We often run past a shop and buy ice cream or candy to motivate him. We have trails of different lengths. I try to make it fun...It is important that training is not something he must do alone. He must do this every day of his whole life, and therefore it’s important to do something nice. At the same time, he is “allowed” to have some bad days. Then we walk instead of running. If things are done properly, we take the bicycle, we go for a quick walk, we go to eat an ice cream. Things like that. Small things. I do not want to promise things totally out of scope. Medication was like a game played with my mother. It is sometimes difficult to motivate. It feels unfair to be different...We have used stickers as awards, and we had agreed upon some items after collecting a certain number of awards, but it loses appeal after a while. We had family problems and were not motivated to learn [...] I started very early in my life to take care of my young brother. We have regular consultation with the dietician in the context of the quarterly control. We receive advice to improve his appetite [...]. We follow as much as we can. Implications for design: support for learning about the disease and for understanding the purpose of the treatment and how it works are important for compliance. Reminders and checklists are simple means for those who forget. Additionally, support for motivating, for example, through gamification or playful interfaces, should be considered. Who will reveal they are not doing what you have told them? Registering information is demanding and revealing. People are very different. Some do not have any overview and others have neat handwritten notes about everything that has happened day by day. The centre has a multidisciplinary clinic where patients come and are seen individually by pediatrics, nurses, physiotherapists, sometimes by a psychologist and sometimes by a dietician. The patients come every 3 months for consultation. Some caregivers, the physiotherapists and dietician do not see the patients every time they come. They try to see every patient at least once in a year. If they have problems or special questions, they see them more often. Normally I go to the doctors every three months, except if things do not go well. We are going every three months to the control. It is a multidisciplinary team. When you go, it is often half a day, one afternoon for example. You see the dietician, the physician and the lung doctor. All these professions because they cover the disease together...Between the controls, they are always reachable by phone. Depending on needs, the yearly control lasts from one to three days. For some it may be a bit longer. Patients can communicate with the CF centre between consultations every 3 months. The centre has a central phone number and email address. The nurses and secretaries take care of messages. The nurses may answer themselves. If they think a doctor has to answer, they forward to one of the doctors. If every patient contacts a specific doctor, the centre loses overview of what is happening. Using phone and email, the patients avoid coming to the centre when they have a small problem. We have continuous contact with most patients by phone and letter. We do phone consultations. [...] We are now establishing a new video communication service. [...] We have contact with the vast majority of patients every year. The threshold to contact us is low. The critical issues are handled face-to-face. I do not usually contact the doctors between consultations, except if I get really bad...Normally I send an email and the nurses handle the request. I never contact the doctors directly. This works well. I get answers rapidly. All patients say that telephone consultations are annoying during the daytime. Everyone is at work during the daytime. Phone works in the afternoon and evening. The information is not always correctly registered. For instance, when a patient contacts the centre to tell about a problem with a drug. Somebody may tell the patient to change to another drug, but not record it in the system. So when and why the change is done is not recorded. Inhalation is challenging. This is a big responsibility for the nurse and for the physiotherapist. They try to instruct the patient in the correct way and to evaluate. When the patients start a new drug, they try it for the first time during the consultation to see if they can do take it properly. I communicate with patients also by phone and email, if they have questions or problems. I give advice for the enzyme supplement. I look at the weight evolution, at the height evolution, and adapt the enzyme supplement in order to increase weight and height. We travel to schools and kindergarten and provide recommendations. Local physiotherapists may also ask for assistance. Patients can learn to do physiotherapy themselves. This is what most patients do. Patients know what they have to do, to clear their secretion. However once or twice a week, they go to the physiotherapist. The physiotherapist can apply more pressure on the thorax and feel, where secretions are, so it is better. As far as the treatment is concerned, he is very conscious and does it in a responsible way. He goes to physiotherapy every day, 7 days a week, even Saturday and Sunday. [...] We have learnt ourselves too, but do not do it as good as professionals. We know just enough to be able to go on holidays...Now he is older, so if we are doing something wrong, he can tell how to do it. Physiotherapy depends on his status of coughs. It can be one, two or more times a day. [...] Fortunately, the physiotherapist is coming to our home. On the weekends and if we go on vacation, we give the physiotherapy ourselves. It is preferable that a professional gives the physiotherapy. A good nutritional balance is extremely important for CF patients. It is, however, challenging to keep track of the nutritional status. The CF competence centers involved in the study sometimes ask their patients to perform a 4-day collection of detailed food records. Recording can be done in connection to the yearly in-depth consultation, or requested by HCPs when a particular problem occurs. Regular nutritional protocols can help centers to keep an overview of the nutritional intake of the patients and to identify possible reasons for occurring symptoms. But neither the patients and caregivers nor the HCPs are pleased with the procedure and the results of it. Recording the quantities. You forget any ingredient and then it must be rechecked. The weight of each ingredient. You should introduce it in grams but it would be easier to introduce “standard” measures (a small spoon, a glass, a cup of coffee...). Additionally, there are many different ways to cook the same plate. It should be personalized as you cook and the ingredients that you use for doing a plate and how to cook them. It [the nutritional protocol] must be as precise as possible regarding ingredients, amounts and cooking process. Not enough details, incomplete information and too vague amounts. Some patients live quite far away, it is very expensive for them to come to the consultations and check-ups. It is very expensive. And transit doesn’t get paid. In comparison, at our centre it is good, 4-5 doctors for 120 patients, this is good. In Munich [big city in Germany] for example, 4-5 doctors are responsible for 400 patients. The amount of patients is increasing, the relevance is increasing. There are rural areas, where the care key doctor/patient is worse. It is a challenge to establish good medical and interdisciplinary disciplines in Norway, which is necessary to deal with a condition as complex as CF. [...] It is important to understand that professionals in local hospitals, who may have one to three patients, do not have the opportunity to accumulate sufficient experience. In ages from 15 to 25 [...] Moving from pediatrics care to adult care can also be challenging. Children often get more support than young people. I give the daily physiotherapy following instructions from the local physiotherapist. The local physiotherapist was trained by the CF competence centre. The local physiotherapist comes home once a week. Sometimes when I ask a mother more details about symptoms, for example “when does it happen?” she cannot always answer, and I see that she feels bad about not remembering. It is difficult for me too. I know that she spends a lot of time caring for her child. It would be helpful with an app that helps remembering what happened. When you go to the doctor, you tell about how you experience things, and you may tell in different ways. What cannot be measured objectively is your own experience. An app can help the patients and parents to structure their experience and to reflect about what happened. People may have the same disease, but experience it in different ways. On the basis of the data gathered as described above, we derived a list of main properties and support functions our CF app (or apps) should have to support patients in an optimal way. These properties and functions will be explained in more detail in the following section. Figure 2 gives a summary of this list and shows how app characteristics correspond to the identified needs of the users. The app should be easy to use! Easiness and quality should be pointed out! I would register yes. It must be simple and easy. No writing, just select options after one first configuration. Not only is the ease of use of apps for children and teenagers with CF and their families essential, such apps also have to be customizable. The need for such personalization is stemming from the variability of the disease and the individuality of the patients. 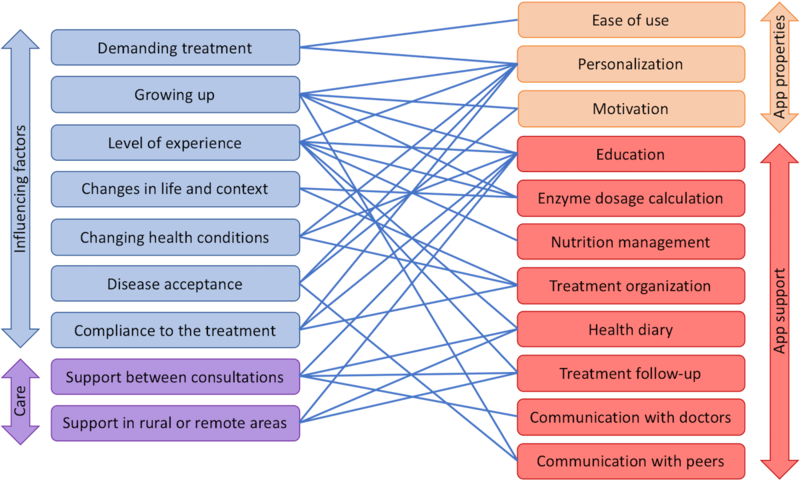 Despite having the disease in common, the patients do not necessarily share the same treatment routines, knowledge about CF, and other personal characteristics such as hobbies and life circumstances. The level of experience of patients and relatives varies quite a lot: some patients and parents need more knowledge, for example, especially when they are newly diagnosed. Others, who are not confident yet with the dosage of enzymes, need more help with this, whereas others only need support, calculating the right amount for special occasions. Digital support has to be adaptable for these different needs. Furthermore, when growing up, the purpose of the app changes: at first, gaining knowledge about CF is most important; teaching children in an entertaining way has high priority. Older children are supposed to start managing CF on their own. Motivating elements are needed at all times, but they have to be adaptable to the needs of the different age groups as well. Not for Creon, it is usual, [...] (And asked about the necessity of reminders for other treatments): Not, if they are as now. But if they would increase, it could be useful. It could be useful for antibiotics because it is distracting the routine of the daily treatment. It would not be a bad idea to have a reminder. It is true that sometimes the antibiotics treatment can be hard to follow. With differences in the level of acceptance of the disease, needs may differ in terms of how much children and teenager with CF would like to communicate with peers or other HCPs. On the other hand, for persons with CF who are having trouble accepting their disease, motivational elements are immensely important, and education about CF within the app could be more helpful than for others. Finally, the access to specialized medical CF care varies between countries, as does the availability of education about CF. In the case of Norway, for example, there is only one CF competence center, as compared with a large number of specialist CF care centers across Germany. The way the specialist CF health services are organized can hence influence access to expert consultation and support that some patients would ideally need. [Motivation] is difficult because it [the treatment and the disease] is individual for each patient. You cannot tell a patient that if you do your physiotherapy, your lung function will improve by 5%. We cannot say that because it is like a promise which may not come true. Please very positive messages! Supportive! You can better motivate with height [...] A game is helpful, how the disease works, understanding what doctors are saying [...] a quiz is always good! Rewards also! It is important that the app gives information directly to the child so they get motivated to eat well and take their Creon well. It is important that the children get motivated and that they get knowledge about their food and Creon. For the children, it is important to educate them by entertainment. It is important that children know what they are doing and why. Often parents do all what they have to do, but 9-10 years old children cannot tell why they are doing it. Children should be instructed from the beginning. A Game would be helpful. How the disease works, understanding what the doctor is telling. [...] A Quiz is always good, rewards also! As elaborated above, especially parents of newly diagnosed children need support in learning about this disease, which is complex and difficult to understand. Educational elements in an app can help them to learn about the disease and treatment and to gain experience in dealing with it faster and therefore to help reduce some of the concerns of the parents. She does not like to talk about the disease. It could be easier if she had an app and could give her phone to an adult when she is visiting them, and tell them “look, this is how it works”. He has to take his medication at school. We (I and his father) met the teachers and the director of the school to present CF and the implications in terms of treatment. They are following up for the intake of Creon. But you have to train them first to make sure they are following up. Some are afraid that they would not get any job, if they tell. It could be useful with quiz etc. for those that are around them. Information for medicine usage would have been useful. There are a lot of questions about it in the Facebook groups. It would be useful if doctors/dieticians can explain possible side effects related to food or medicines. It would be nice to have some app that takes the time. Something that also shows him how to do it correctly. He has to close his mouth, to put it right in his mouth. Also, the breathing he does—it would be nice if there was something that shows him and takes the time. An app where one can take pictures of food, enter information about height and weight, how much Creon is taken, and then provide information about how much Creon is actually needed. I would consult it [app] if I think the actual Creon dose is not enough for what I’m going to eat...and the app recalculates the Creon dose. An app that calculates the amount of Creon for various types of food would be useful. A calculator for Creon would be nice because sometimes it can be difficult to know what caused stomach pain. This may be due to too little Creon, or caused by other things...I am not sure how much time I want to spend to register food to get recommendation about Creon. Patients have a high caloric diet. It is a challenge for the health. It is important that they have a varied diet. People should not only eat biscuits, chips, ice cream. They should eat fruit and vegetables too. It would be good with food recipes and advices. Often, I get sweet recipes, but I prefer salty food. It would have been useful to get an overview of what is good to eat. I have lacked this. It is important to get good eating habits. It would be useful to exchange recipes and ideas about food as a source of inspiration. When he was little, we used to calculate nutrition, especially fat, in all ingredients. [...] As for now, the calculations are routine based. An app can support such calculation. Additionally, an app can also help to enable the dietitian to set up personalized nutrition goals in terms of energy and percentages of fat, proteins, and carbohydrates and to follow up the progress with respect to goals. We newly made a food record for four days when the dietician asked for it, and then one day a week later. The dietician provided a list but it was rather complicated because we had to fill it manually. Finally, I gave her an Excel sheet with meals and details about the food. Normally, they have to be as specific as possible. I ask for ingredients and make a caloric calculation. When I ask for a longer period, the calculation is not so good. The app should support food recording, but asking to record for more than 3-5 days is difficult. The motivation is getting lower over time. It would be useful with support to note approximately what he has eaten during a day in order to give information to the nutritionist. For antibiotics, especially when a particular number of hours should pass between intake. It would be good with reminders. It is true that sometimes the antibiotics treatment can be hard to follow. It is difficult to remember unusual medication, especially when medication has to be taken outside the meals [when other medication is taken]. An app should support reminders: when and how to take drugs, when to go to the physio. For the child and the father! For the pancreatic enzyme. Some kind of reminder in a nice funny way. [...] When he is on holidays, when he visits the grand-parents. An app which makes it possible to cross out when a task is done...There are many tasks to accomplish in a day, so it’s nice with a checklist. It’s a good feeling to see that assignments are “checked out”...One can go back and see what has been done. It’s nice for remembering afterwards what was done. Collecting information with an app is more systematic than what you can say over the phone, or when you sit and fill out a form and then insert it in a PC. Patients often forget what has happened between consultations. An app for following day-by-day would allow more correct estimations. The patients could keep a diary without sending it systematically to the doctor, allowing them to answer the questions of the doctors. The diary could contain information about coughing during night, coughing during exercise, shortness of breath, stomach pains, diarrhea, problems taking pills, feeling bad. A list with ticking would make it easy. A weekly diary may be sufficient. We remember well [his health condition] because he is stable. I imagine that it would be nice with an agenda or something like this if he was not stable. It should be focused on things that are important to report. And it should be easy, for instance in form of a check list. Very concrete things such as “Did the child cough during the night?” “Did the child have stomach pain?” should be covered. There could also be a field for notes. It would have been nice, also with a space for noting changes in condition, so that one can compare over time. If not, there’s no point. Anything that can increase compliance will be fine. [...] It could be useful to detect the effect of antibiotic cures and the side effects. It is important for the therapists to know how the previous cure worked when setting up a new antibiotic cure. It is important to provide a positive educational solution. An app should put attention to what works well. And maybe a graphical overview where the patients can see how the daily life looks like and how things change. May be a score, and then they can check off [entries] throughout the day, and get points for the day. And it is important that those who are very sick also score high. I would share my diary with the doctor so he could quickly see information about me. I have nothing to hide. It is best for me, when he knows more about me. To register information and share it with doctors would be nice. It would be easier to inform the doctor. It would have been nice, but the patient must make the choice himself and he should decide what information is shared. I believe that most patients would share if this can help them. There is no guarantee that everyone has a good relationship with their doctor. The sharing of information must be made after agreement with your doctor. As earlier mentioned, a doctor pointed out that noncompliant patients would probably not reveal that they do not follow the treatment. It would be nice if the doctor could get one month status for example. The doctor does not have the capacity to follow up on a daily basis, but a regular overview of symptom development would have been nice. It would be good to register things such as when I am coughing more. It would be good if the doctor can see that you have this problem now and then. It could be good to tell how you cough or what colour the mucus has. It would be good if the doctor could see more often than every three months. This would make it possible to anticipate, and maybe avoid hospitalisation. You cannot drown in information. And it must be handled privately. As soon as information comes to the hospital, it is sensitive health information. You have to agree how often to register the information as well. Communication with doctors covers more than sharing data registered by parents and children and teenagers with CF. The setting of nutritional goals by dietitians and the sending of motivational messages by HCPs were also considered. We use the association a lot. The closed groups on Facebook are very important. There, we can post questions and get answers from the other members. One often gets very many answers right away. There is much happening there. It is very, very helpful. The association organises a system of “peers.” It is a system where people with CF and parents can talk with other persons with CF and parents. There are 21 “peers” that have been taught through courses. They have guidelines about how to work. They are available almost the whole day. Sometimes I think that it would be good to talk with somebody who can understand me, rather than to people who tell me “yes, yes.” But this is not a critical concern. I have not investigated if there exist forums. The association has a Facebook community, but there is not much happening. We are members of the CF association. Sometimes I mail to the association. It is more when I need something. It is not active participation. On Facebook they have a page, but I think that it is not so active. Digital meeting places may be well-suited communication channels for persons with CF, who should avoid meeting other persons with CF because of the risk of cross-infection. It might be challenging to keep meeting places active. It is important to define appealing activities for the participants. We saw earlier that exchanging recipes is suggested. Really interesting and exciting, to meet and to exchange views with other patients! Yes, it is good. We always help each other, giving ideas or options that may help. This would be very helpful! Useless, because everyone is different, also as patients. No, too risky without a doctor supervision. There are some Facebook groups, but I don’t like it, because they don’t have a clinical mediator/controller, so a lot of times other parents talk about incorrect information. This implies that an app or apps should give the option to communicate with others, but this shouldn’t be mandatory. The findings presented here have been made possible by the overwhelming dedication of potential future users to bring forward developments that could support them in the future. The interest in the research was high, and participants openly provided their ideas and wishes. This interest and the numerous suggestions from persons with CF and caregivers indicate the readiness for self-management in the CF care even in countries that provide well-functioning health care services for CF care. Some of the functions presented here confirm findings by previous research, such as the wish for reminders for medicine intake, a function for automated medicine refill, or the visualization of treatment progress . We provide more detailed insight regarding the needs related to these functions. In addition, we identify other potentially useful functions such as support for enzyme dosage calculation and nutrition management. A recurrent need was that all functions should be included in a single app. During the search for CF-related apps performed before the interviews, such an app was not yet available on the market. The complexity with respect to the large variety of needs and related functions is one of the biggest development challenges. An important finding is the need for personalization, stemming from the individuality of the patients, from the level of experience with the disease and treatment, and the changes in life; “One size does not fit all” in the case of CF self-management. The changing needs as children with CF grow up and gradually take responsibility for the treatment supports the idea of an ecosystem of apps proposed by MyCyFAPP. Additionally, other factors influence the care, indicating that each app in an ecosystem should be customizable. Software engineering approaches for developing adaptive software  and end-user development  are highly relevant. The HCPs in the study failed to elicit requirements for a professional tool. Although they were asked about how a tool could facilitate the care and how a tool could fit in their workflow, they were more concerned with discussing the digital support for patients. As a starting point for the design of a professional tool, the functionalities supported by the apps can be reflected in the tool, for example, support for nutritionals goals, educational content, and treatment follow-up. In our future research, it will be important to set more emphasis on self-management as a collaboration between patients and HCPs rather than a delegation of tasks to patients. For this reason, codesign workshops and extensive testing of different versions of the prototypes together with HCPs are planned. This will allow to focus on the development of a professional Web tool covering the needs of this specific user group. Data sharing on treatment progress with HCPs is potentially useful. Sharing can contribute to providing HCPs with a better understanding about the health status of individual patients and at the same time to increase knowledge about the disease through comparison and analysis of data collected from several patients. Several concerns should, however, be addressed. Most importantly, sharing should not be imposed on patients, but the “what?” and “how?” of sharing should be agreed on between patients and HCPs. For example, they should agree upon how often patients are expected to register data, and they should agree upon how often HCPs are expected to study the shared data. Several HCPs mentioned that the quality of data is not so good when patients are asked to register every day. This is an issue that should be further researched upon to find suiting solutions for it. One should avoid giving medical advices. Advices can be dangerous without any medical supervision. With the growth of chronic diseases, patient empowerment, where patients manage their own health condition, has emerged as a means to release health care systems under pressure. Two important aspects of empowerment are (1) skills development and (2) choice and responsibility . Choice and responsibility presume care practices that enable shared decision making (ie, the patient is involved in health care decision-making processes) and self-determination (ie, the patient has the power to choose own goals). Choice and responsibility require the patient to hold self-efficacy skills (ie, the patient is confident that he is able to carry out the necessary behavior) and self-management skills (ie, the patient has gained skills to manage lifestyle-related aspects of the disease). These skills in turn require education (ie, the patient is educated to deal with the disease and its treatment). Our study shows that a full patient empowerment is unrealistic in the case of CF. CF is a serious chronic disease that requires high expertise for decision making. The focus should be on giving patients the necessary knowledge to feel confident in carrying out the treatment. When developing apps for the therapy support of chronic diseases such as CF, which are additionally characterized by a high individuality in the manifestation of the disease, user integration in the development process is crucial. It helps not only to maximize the added value for the user but also user satisfaction  and ultimately influences user experience. The current research is based on a large sample of participants. It includes various perspectives by presenting the views of patients, parents, as well as HCPs. This ensures that needs and challenges of different people involved in the treatment can be considered during development. The participants who contributed to this research come from different countries across Europe and different age groups, which further increases the diversity of the sample. Although the benefits can be large in terms of developing an app that serves actual user needs, it can be a challenging task. In this study, patients had to be interviewed one at a time to avoid cross-infection risks, so we were not able to organize group interviews allowing discussion of different viewpoints. Additionally, the views of participants represented in here reflect only those who were willing to take part in a research project. Needs or wishes by those who were not interested or prevented from participating may potentially differ significantly. Furthermore, most of the involved participants were in a more or less “stable” condition. Only very few children and teenagers with CF in a severe condition were asked to participant in the study, to not burden this user group even more. However, we were able to collect insights from HCPs, patient association representatives, and the netnography, which represent more general opinions that can partly balance out this knowledge gap. Furthermore, as participants who show interest and or are in a condition that allows them to take part in such a study are potential first adopters of the solutions, it is important to fulfil their needs. Needs and wishes of very young patients (aged 4-7 years) mostly were collected with the help of interviews with parents and HCPs or with the help of interviews with children together with their parents. The young children involved found it very difficult to sit through an interview and give answers to questions of the interviewer, especially the more abstract these questions were. Therefore, insights regarding their needs are strongly affected by the opinions of parents and HCPs. To balance this out, this age group will be more involved later on in the project via cocreation workshops and prototype testing sessions as soon as there are more concrete products (mock-ups and prototypes) they can give feedback on. Authors of this paper, on behalf of MyCyFAPP consortium, acknowledge the European Union and the Horizon 2020 Research and Innovation Framework Programme for funding the project (ref. 643806). The authors would like to thank all project partners for the collaboration during participant recruitment and project management. Without the dedication of participants in terms of time, effort, and valuable input, this publication would not have been possible. The authors would like to thank all participants who contributed to this work. Rijken M, Jones M, Heijmans M, Dixon A. Supporting self-management. In: Nolte E, McKee M, editors. Caring for People With Chronic Conditions: A Health System Perspective. Berkshire: Open University Press; 2008:116-142. ISO 9241-210:2010. Ergonomics of Human-System Interaction -- Part 210: Human-Centred Design for Interactive Systems. Geneva: International Organization for Standardization; 2010. Oates BJ. Researching Information Systems and Computing. London: SAGE Publications; 2006. Yin RK. Case Study Research: Design and Methods (5th ed). Thousand Oaks: SAGE Publications; 2014. Kozinets RV. On netnography: initial reflections on consumer research investigations of cyber culture. Adv Consum Res 1998;25(1):366-371. ©Jacqueline Floch, Annabel Zettl, Lena Fricke, Tina Weisser, Lisbet Grut, Thomas Vilarinho, Erlend Stav, Antonio Ascolese, Cornelia Schauber. Originally published in JMIR Mhealth and Uhealth (http://mhealth.jmir.org), 08.05.2018.